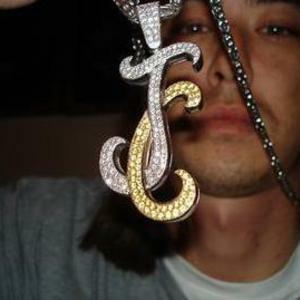 Jackie Chain is a native son to Huntsville, AL. Jackie found his love for rap music at an early age, growing up in the trailer parks and listening to his favorite groups such as Eightball and MJG, UGK, 3-6 Mafia and Too Short. As early as 5th grade Jackie had won local talent shows by displaying his unique ability to rap and win over a crowd. The fact that Jackie is half Asian added to his reputation as people began to take notice of his talents. Jackie lived a troubled childhood moving from home to home and state to state after his mother left him at the age of two(to this day he still has not spoken to her or even knows if she is alive and perfers it that way). At age 16 he was kicked out of his fathers house and turned to the streets. Within a month he had a 5 bedroom house with a pool and several cars, all this while still in high school. All his hustling finally caught up to him and by the age of 18 he had two felonies looking at a prison stint. During his two years of incarceration for distrabution of narcotics Jackie worked on his love of hip hop, that is even where he got his name Jackie Chain. Jackie credits his time inside the penn for helping mold him into the artist and buisiness man he is today. Having spoke to alot of people and reading alot of books he learned about the music industry and knew it was his true calling. Jackie has had the fortune to have preformed from Atlanta, GA to as far south as Panama City, FL all the way up to New York, NY way out West to Oakland, CA. He has opened for groups such as TI, Paul Wall, 3-6 Mafia, Mike Jones, Lil Boosie, Lil Weebie, Master P, Bone Thugs and the list goes on. For three years Jackie has been the only local artist to share the main stage with National Acts at the annual WEUP Black Arts Festial in front of 50,000 people. He is always on the grind, everywhere from TJ's DJ's, SEA Awards, Ozone Awards, Allstar Games, Core DJ's retreats even walking the Red Carpet at the BET Hip Hop awards. He has been in articles such as the Patiently Waiting section in Ozone Magazine, top songs to download for 08 in SPIN magazine, next 100 artist to blow in URB magazine just to name a few. He was on an FYE tour which was promoting his single Worldwide that debuted 10 and peaked at 3 on the Billboard Hip Hop and R&B single charts off the album WHOAMI. He moved over 10,000units in retail stores and on the streets. His next single 'Rollin' took the country by storm! With a trance beat and a Gucci Mane hook Jackie gained the interest of many major labels by getting spins on various radio stations and in clubs. With a strong industry buzz and an even bigger street buzz Jackie finally teamed up with a&r Nigil Mack of Universal/Motown for a label deal with Touchzone Records, a label Jackie owns with two other partners. He is now working on his latest cd which is getting ready to be released by Touchzone/Universal Motown. With the love to preform he as won different Hip Hop performances such as M.I.C. conference in Birmingham, AL, received the Mixtape of the Year award at the Dead Serious Awards (also known as the underground Grammys), for his WHOAMI mixtape hosted by DJ Burnone. Within a year of moving to Atlanta, GA he won the Almost Famous Showcase, Eastside and the Westside Poole Palace, Road to Success at 112 and was invited to the Best of the Best twice at the Royal Peacock. His song Blinded by the Light won 4 times in a row on the 107.9 Battlegrounds with the Durty Boyz, and 'Rollin' won on 95.7 jamz. Jackie has been able to do songs with some huge names such as Bun B, Lil Weebie, Kiashine, Shawty lo, and Haystack. He has had the pleasure of working or is currently working with producers such as Grammy Award winning Wonder& DJ Toomp, Tom Slick and Package Store of Colipark Music, M16 (Duffle Bag Boyz) and Grammy Award winning Justice League. He has several intros for various stations and is in rotation at WEUP in Huntsville, AL. He is also in rotation and on several mixshows all over the country. The Internet is going crazy as far as Switzerland and Berlin where Rollin is the 1 requested song and as close as Birmingham where Blinded by the Light is in constant rotation on Good Fellas Radio. Jackie is currently promoting his Mixtape WHOAMI hosted by Grand Hustle DJ Burnone and his new single Rollin across the Southeast creating a buzz that only an artist of his caliber can create. He won an award at the 08 dead serious awards and also won an ozone award this year. Jackie Chain is coming to a city near YOU! !